For the last 13 years, I have been studying and teaching yoga. When I first start teaching, I said yes to every opportunity, often leaving me with no time to practice myself! Over the years, I have learned to prioritize-replenishing my soul with my practice before I can help others do the same for themselves. My goal is to create classes that help students find balance with their physical, mental, emotional and spiritual bodies. My sequences are a combination of flow, and static poses along with feel good seated poses, breathwork and meditation. Yoga can help you face the unexpected in life and can be particularly helpful when trying to conceive and going through fertility treatments. Below are a few of my favorite sequences. If you are new to yoga, sanskrit or the asanas (postures) this pose finder may be helpful. Inversions like Adho Mukha Vrksasana (Handstand Pose) teach us to face our fears and build courage. Handstand challenges us to literally see a different perspective, as we go upside down. Although, more than any other pose I teach, I hear students talk themselves out of handstand before they even attempt to get into it. Taking the steps to get into handstand on my own and to work on the pose once I am in it, have taught me persistence, and bravery. I visualize getting into the pose, before I even attempt it and once I am in it, I remind myself that there is nothing to fear (the floor isn’t that far away after all :)) and I am in control. As far as inversions go, it is one of the safer ones to practice (against the wall) because there is no weight on the top of the head. Inversions like headstand and shoulder stand, if done improperly or without necessary props, can potentially cause strain on the cervical spine which can lead to major neck issues and chronic pain. As long as the shoulders and wrists are injury free, practicing handstand can be fun. So embrace it and all it can teach you! Woven through this sequence are a lot of hamstring and hip flexor-opening exercises as well. In Yoga we say that the front of the thighs represent fear, where the back of the thighs represent the future. As we work to open the hip flexors, we move into that fear and release it. As we open the hamstrings and backs of the legs, we are open and ready to move into the future and embrace all that is waiting for us. Variations with Plank, Chaturunga to floor, back to plank. Urdva Danurasana or Upward Facing Bow pose, is a heart-opening pose like no other. It opens up the entire front line of the body and the door to Anahata, the Heart Chakra. I like to think of myself as someone who has always been very open to love, and I have always been a very optimistic person. But after years of pregnancyloss and trauma, it started to take a toll on my whole self. I recall moments where I would catch myself standing with my arms crossed in front of me while having a conversation with someone. My body language literally saying “I am completely closed off to whatever it is you have to offer...” My shoulders started to round forward a bit more and I started to feel how my upper body was getting tighter. I just wasn’t able to open my upper back and chest (nor my heart) the way I used to before the losses. I wanted to rekindle that love in my heart, so as difficult as they were to embrace, I knew that back bends needed to be incorporated into my practice more. And almost immediately thereafter, I felt more connected to myself and felt like I was on the road to healing. First, I noticed the openness physically, and then came the emotional release and then the mental clarity. Anahata is at the center of our Chakra system. It connects the lower three chakras which are related to earth and matter with the upper three chakras which are related to a higher awareness and spirit. Anahata means “unstruck.” Regardless of the pain we have endured in life, at the core of our heart we are pure, boundless love and at peace. For this reason, it is, in my opinion, one of the most important areas to focus on in our yoga practice. It reminds me to stay connected to what is real and most important within myself. It reminds me to trust. This Sequence leads to Urdhva Danurasana and has a second peak pose of Sirsasana (Headstand Pose). Sirsasana is a great prep pose for UD, as it works on similar actions in the arms. I end with a number of forward bends to counter all of the backbends. It is equally important to open the back line of the body to balance out Anahata Chakra. Adho Mukha Svanasana: AMS (Downward Facing Dog) into Plank, Chaturunga all the way to the floor. 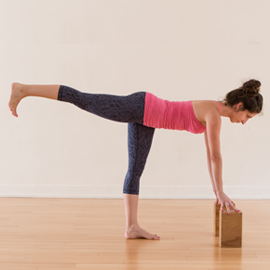 Dynamic Setu Bandha (Bridge Pose) with block between thighs. Roll forward and back and up into Paripuna Navasana (Boat Pose). Paripurna Navasana (Full Boat Pose) into Ardha Navasana (Half Boat Pose) several times. Rock forward and back all the way up to stand, Tadasana. Dynamic movement into Vira II several times, then hold for several breaths. From AMS, step forward into High Lunge-bend and straighten the back leg to emphasize neutral position of pelvis and to open the hip flexors. AMS into Plank into Chaturunga to ground. Fold two blankets across belly and pelvis to relax the body and feel grounded and protected. Ardha Chandrasana is a balancing pose that works to strengthen and open the hip of the standing leg. When practicing balancing poses we practice single-minded focus. Being able to stay focused and not let my mind wander off in a million different directions was so important for me while we were on our journey to parenthood. It was so easy to get sucked into an obsessive compulsive way of thinking and into negative thought patterns as I wondered how and if we would ever have a child. Balancing poses like Ardha Chandrasana (half-moon pose) and Vrksasana (Tree Pose) helped me stay focused and get grounded. They reminded me, and still remind me, to stand where my feet were planted and not to project too far into the future. They taught me patience. According to Yoga Journal, “Yogic tradition holds the hips as a storage ground for negative feelings and pent-up emotions, especially ones related to control in our lives.” I end this sequence with a number of seated hip openers to allow space for the next chapter in my life. Open Shoulders with gently shoulder rolls, moving in and out of Gomukasana Arms. Bring awareness to breath. Guided mindful breath for three minutes. Leg lifts with knees bent to educate and work abdominals. Legs lifts with legs straight, if accessible, to educate and work abdominals.